The waxwings are passerine birds classified in the genus Bombycilla. They are brown and pale grey with silky plumage, a black and white eyestripe, a crest, a square-cut tail and pointed wings. Some of the wing feathers have red tips, the resemblance of which to sealing wax gives these birds their common name. According to most authorities, this is the only genus placed in the family Bombycillidae, although Phainopepla is sometimes included. 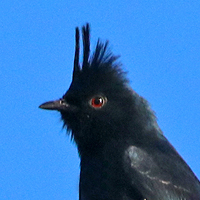 For the purposes of this guide, I have included Phainopepla as well as European Starling, and American Pipit--making for 5 species in this group in Utah.